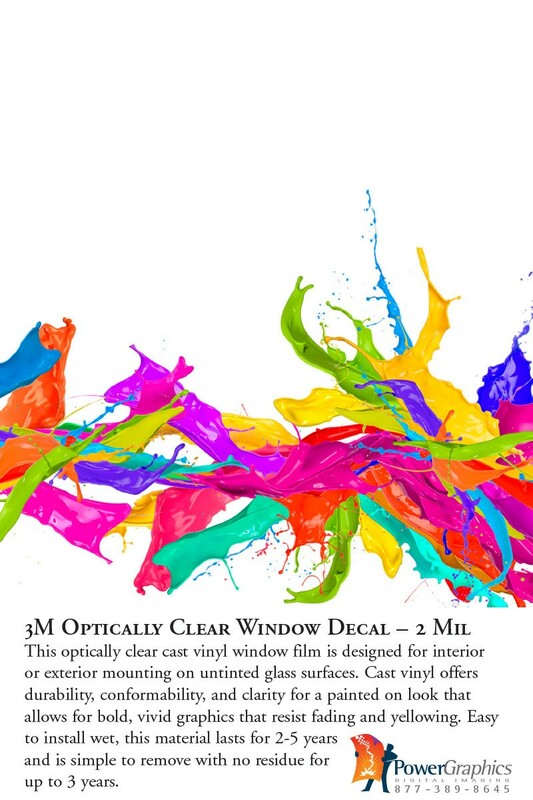 This 2 mil optically clear cast vinyl window film is designed for interior or exterior mounting on glass surfaces. The special adhesive allows the graphic to remain removable for up to three years, while allowing unprinted areas to offer a completely clear view through the glass. This 2 mil optically clear cast vinyl window film is designed for interior or exterior mounting on glass surfaces. The special adhesive allows the graphic to remain removable for up to three years, while allowing unprinted areas to offer a completely clear view through the glass. 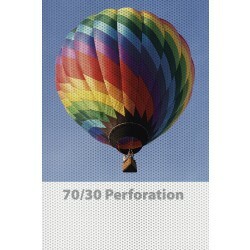 Optionally, the image areas can be under-printed with white for the best visibility in a window. This material should be installed wet, and instructions are available in the Installation Instructions tab, as that's the best way to achieve a clear, bubble free appearance on glass. Because this is a cast vinyl, it's conformable to curved surfaces such as car windows. Available in widths up to 60". 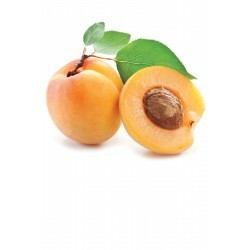 Approximate longevity of 2-20 years indoors, 1-3 years outdoors. 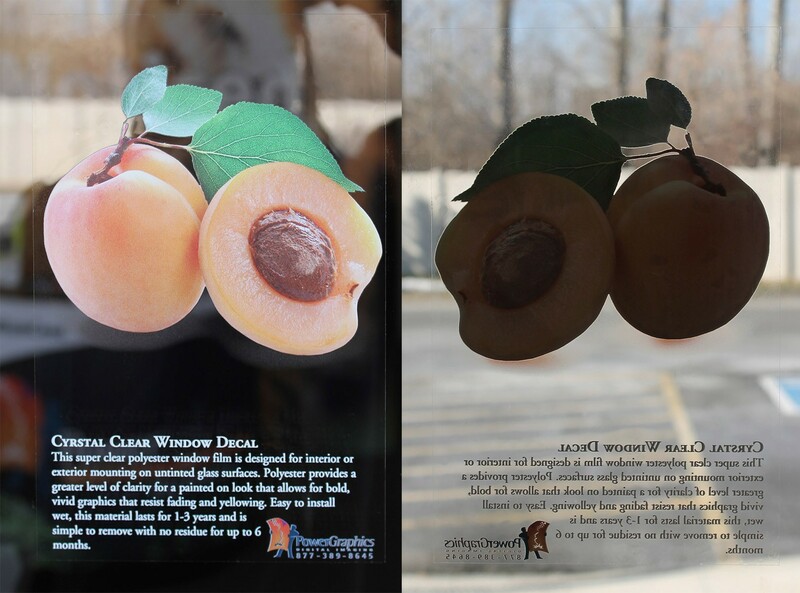 The product photos above show the 3M Optically Clear Window Graphic sample on a window from both the inside and outside. Generally, we recommend the white floodcoat behind all or part of the design when the decals are being used for advertising purposes because they make the image much easier to see. If the graphic is being used for decorative purposes, it's best without the white floodcoat as it will look brighter from the inside. In the example photo, you can see how it's almost impossible to see the clear areas of the decal, other than the edges, For that reason, it's common to cover an entire pane of glass if the goal is make it difficult to tell there is a graphic on the window at all. The clarify of the film makes it virtually disappear on glass, mirrors or acrylic. The graphic stays cleanly removable for 3 years, where other materials get more aggessive over time and are only guaranteed removable for 6-12 months. 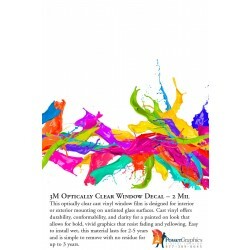 Because it's so clear, it will show any small bit of dirt or flaw if the window isn't thoroughly clean. The film can scratch during installation if a sharp squeege is used or dirt gets on the graphic, and those scratches will be visible because of the clarify of the film. It's vinyl so it's not eco-friendly.